A fun trail bike to hit your local loops. 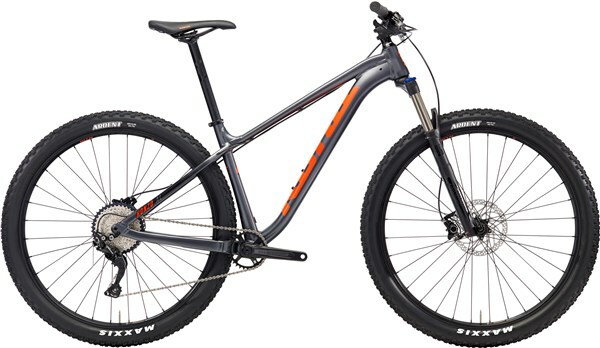 The Kona Honzo AL has an alloy hardtail frame that puts fun first, with a super short rear end and robust build. The Shimano 10 speed drivetrain delivers reliable and slick shifting, getting you to the top with no trouble. The wide WTB wheels and Maxxis tyres combine to offer great grip and rolling speed. Making sure you have the control on the trail is a RockShox fork sporting 120mm travel. The Honzo is the original low-slung, trail-ready hardtail. Its progressive geometry has been updated over the years, but its fun-loving attitude hasn’t changed one bit. It’s the 29er that doesn’t feel like a 29er, the dependable friend that’s always ready to party – and maybe to get into trouble with you once in a while. With a 120mm RockShox Recon fork, RaceFace Aeffect crank, wide range Shimano Deore 1x drivetrain, and Maxxis Ardent tyres, the Honzo AL is ready to get the party started. Front Tyre: Maxxis Ardent WB 29x2.4"
Rear Tyre: Maxxis Ardent WB 29x2.25"